Meridian Senior Living Announces Student Scholarship Winners of Video Contest: Every Family has a Story, Let’s Hear Yours! On Friday, September 21st, Meridian Senior Living was pleased to announce national and regional winners for education scholarships totaling $8,000 for its “Every Family Has A Story, Let’s Hear Yours!” video competition. On Friday, September 21st, Meridian Senior Living was pleased to announce national and regional winners for education scholarships totaling $8,000 for its “Every Family Has A Story, Let’s Hear Yours!” video competition. With this scholarship opportunity, Meridian Senior Living was aiming to encourage cross-generational development and grow relationships with family members who are living in their senior living communities. Meridian Senior Living announces six scholarship awards: $3,000 each for two national winners: Olivia Bell and Caleb & Betsy Nelson; and $500 each for four regional winners: McKenna Gierman, Caroline Herring, Brook VanDerAa, and Serenity Zwaschka. These scholarship awards were based on videos that participants created highlighting their grandparents who are residents of Meridian Senior Living communities. 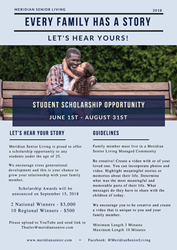 Meridian Senior Living opened this scholarship opportunity from June 1st to August 31st to students under the age of 25 who have family members living in a Meridian Senior Living managed community. Each student participant entered their own 3 – 10 minute length video showcasing their loved relative and the most meaningful and memorable parts of their life. They also included messages to share with the children of today. Meridian Senior Living was excited to offer this opportunity to students not only to supplement their education, but also to encourage the preservation of memories and facilitate the connection of their residents and their families. Meridian Senior Living, LLC, a privately held company, owns and operates senior housing communities across the United States. With more than 7,000 beds, Meridian is currently the eighteenth largest senior living care provider in the United States. Meridian prides itself on providing the highest quality care and affordable living options to residents in their own communities. Although large in scale, Meridian focuses its growth effort on building state-of-the-art properties in cities outside major markets. For more information on Meridian Senior Living, visit us online at http://www.meridiansenior.com.